I currently write from New York’s beautiful Finger Lakes region, where this year’s Wine Bloggers Conference has taken over the town of Corning. We recently finished one of my favorite of the conference’s annual activities: Speed Blogging. Here’s how it works: Winery representatives move from table to table around the room, spending five minutes at each pouring and describing their wines. —2011 Ventosa Vineyards Cabernet Franc: Winemaker Jenna LaVita poured our first of 10 tastes. “It’s a trustworthy wine,” she explained, “and it’s the first grape I really worked on. It showed me the ropes. I feel like I have a personal connection to it.” It shows. The wine has big, fruity aroma and it tastes rich and round and full. It has a heft that some of the other Finger Lakes Cabernet Francs have been missing. It’s beautifully balanced, and I would happily pay the the $27 price tag, and then some. —2012 Damiani Wine Cellars Barrel Select Cabernet Franc: Our second Cab Franc had a fruity and spicy aroma, verging on herbaceousness. Owner Lou Damiani explained that this wine is unfined and unfiltered, and it’s his favorite wine. Again, it has some heft to it. It’s a big wine, with serious dark fruit, big but supple tannins, a little underlying funk and plenty of acids for balance, not to mention a significant 14% alcohol. It has a serious price tag, too, costing a cool $43, but I suspect that only seems expensive because I’m sitting here in the Finger Lakes. —2013 Lamoreaux Landing T23 Unoaked Cabernet Franc: Presenter Mario Del Rosso brought over an entirely different but still lovely Cabernet Franc. “Now we’re thinking about Loire Valley style,” he began, “and this [unoaked] style is one that really showcases the grape. It’s a nice choice for white wine drinkers who want to go to red.” After those two hefty Cab Francs in a row, I can’t deny I felt suspicious of this stainless-steel fermented version, but I really enjoyed its ample cherry fruit, focused white pepper spice, hint of violets and generally cheerful character. —NV Idol Ridge Winery “Sparkle” Rosé: Made by a family winery (presenter Michaela Martin is third-generation), this unusual pink bubbly made from Noiret has a very herbaceous aroma, and flavors of strawberry cotton candy, as Glynis of Vino Noire beside me astutely noted. Small bubbles and plenty of lemony acids. Is it worth the $19 price tag? I liked it, but I don’t know if I $19 liked it. —2012 Swedish Hill Cabernet Franc Lemberger: According to winemaker Derek Wilbur, the 2012 season allowed the grapes to ripen very well, which is important for both varieties in this blend. This 60% Cab Franc and 40% Lemberger has an enticing aroma of cherry fruit and mocha, a light body, a touch of spice and some tannins on the finish. It feels a little watery in the middle, but by the third taste, it was opening — I wish I had a little more time with this one! Ah, the perils of speed blogging. $16 or $17, and a good value at that. —Americana Vineyards Baco Noire: This pretty magenta French hybrid is “wonderfully hearty and disease-resistant,” according to the presenter, but that’s not going to sell me on a hybrid. I am intrigued by its spicy and herbaceous aroma, but it has a fairly simple light and fruity flavor, and a dry finish marked by soft tannins. It’s fun and fruity, but I can think of a better way to spend $16. 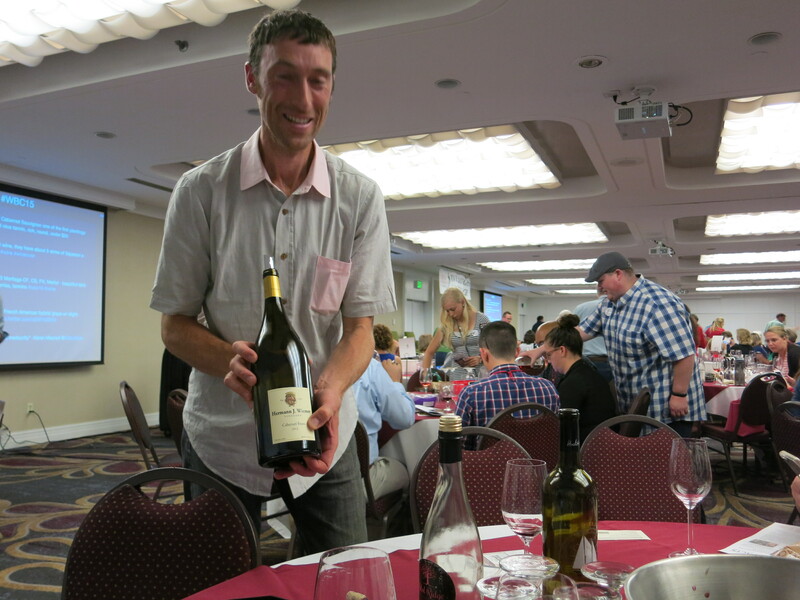 —2012 Hermann J. Wiemer Vineyards Cabernet Franc: Presenter Fred Merwath knew how to impress this table of wine bloggers, pouring his wine from a magnum. This Cabernet Franc has a sultry aroma of dark fruit, dark chocolate, violets and spice, and oo, what a lovely flavor. Lots of dark fruit, big white-pepper spice, mocha-inflected tannins… It’s less weighty and more cheerful than the first two Cab Francs above, and I loved it. A fine value at $25 (for the regular bottle, not the magnum, alas). —2011 Wagner Vineyards Pinot Noir Reserve: This reserve Pinot is made only in certain years, according to presenter and PR Director Katie Roller, when the vintage proves to be especially high-quality. The aroma of dried herbs, cherries and earth certainly smells encouraging, and yes, it has a delightful quality of restrained power. Bright cherry fruit leads slowly to earth and building white-pepper spice. As is so often the case in the Finger Lakes, it’s a fine value, costing $30 a bottle. —2010 Lucas Vineyards Cabernet Franc Limited Reserve: Winemaker Jeff Houck told us that what makes this wine “Limited Reserve” is the vintage. Like Wagner, he chooses only certain years in which to release these wines. It has a surprisingly bright aroma unlike any other Cab Franc I’ve smelled here in the Finger Lakes: red fruit overlayed with eucalyptus. I immensely enjoyed its big red fruit, sparkly white-pepper spice and underlying freshness, followed by supple tannins. Delightful! And again, it’s a great deal at $20. Interesting to see some of the red wines I didn’t get to try at the speed blogging session! I wish I’d gotten to that Lucas Vineyard Ltd. Reserve. Absolutely! That Lucas Reserve was really tasty. I wish I’d gotten to try that Saperavi you mention in your blog!